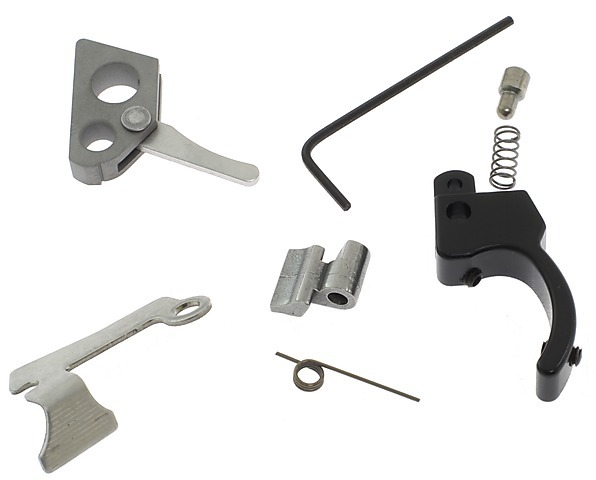 Complete drop-in kit for the new Ruger MKIII to provide a crisp, clean 2.25lb (approx) trigger pull. This kit is based off Volquartsen's very popular MKII kit. The kit features Volquartsen's stainless steel target hammer and a stainless steel micro polished sear (both parts are surface ground for exacting tolerances). It also features a redesigned target trigger. This black alloy trigger is completely CNC machined and comes with both pretravel and overtravel adjustments. A polished trigger plunger and spring is included along with a black Volquartsen extended bolt release (Silver is shown in picture). This assembly is fantastic realy lowered triger pull,a little tricky just watch sear and safety spring if you get messed up it will be there ,Great assembly instructions on you tube Triger is ok but I think the sear is all you need if your gun is new.just my opion but i love it 5 stars. May want to put in the mkii kit, if you want to delete mag safety. Has done magnificent things for my mkiii trigger. No sponge, and a far superior crisp break. The mkii kit does include their hammer bushing, to eliminate mkiii mag safety.